Most of the archeological discoveries from Central Asia now in British museums and libraries were brought here by the explorer Marc Aurel Stein in the early 20th century. But not all of them. Others made their way through the hands of collectors like the George Macartney, the British consul stationed in Kashgar during the same period. Some manuscripts were sent to scholars like Rudolf Hoernle (who was based in Calcutta) in the hopes that they might be able to decipher the strange scripts found therein. On the headed notepaper of the School of Oriental Studies (the ancestor of the current School of Oriental and African Studies) an early to mid 20th century scrawl says “Brought to Sir George Macartney – by natives in Kashgar. Tibetan inventories.” So we’d expect these finds to date from the time when Macartney was stationed in Kashgar, in the late 19th and early 20th century. Macartney was caught up in, and to some extent stoking, the fire of the “manuscript fever” that swept the world at this time, with explorers from the USA, Europe, Russia and Japan all descending upon the Taklamakan desert. Is this old fellow, his clothes already old-fashioned in the 1960s, the mysterious R. Corder? Why else would these photographs be in the manuscript bundle? He certainly seems amused by the whole business. Now that we’ve come all the way to a 1960s photobooth, let’s go back to the Tibetan empire and these wooden documents. Such documents (which we often call “woodslips”) were the way the Tibetan military machine communicated across its desert forts and watchtowers. Cheap to produce, and good from quick messages, the woodslip was the telegraph (or reaching for a more contemporary analogy, the SMS) of its day. Like the telegraph (and SMS) this medium encouraged its users to write in short pithy sentences, leaving out anything that could be easily dispensed with. This fact, along with the military jargon and the foreign words that the soldiers often used, makes the woodslips quite difficult to read. If you know the woodslips that were dug out of the desert by Aurel Stein, this one at least is unusually complete and clearly written. (You can see the others by searching for the prefix “IOL Tib N” on the IDP database.) Judging by the writing style and content, I’m fairly certain it’s genuine. I can’t claim to have deciphered it though, and I’d love to hear some suggestions. It looks like a message (‘drul) asking for a decision (tag chod) about “provisions for the Tibetans (bod) and provisions for the Khotanese (li).” This makes sense, as the Tibetan army units stationed around Khotan included Khotanese attendants. In fact, each unit stationed in a fort would comprise two or three Tibetan soldiers and one or two Khotanese attendants (see Takeuchi’s article below). The message seems to be addressed to a place called An tse, which was somewhere in Khotan. That works, for if this woodslip was found in the Khotan region by a treasure seeker, it would not have been far to travel to Kashgar, where Macartney bought it. On the other side of the slip, I see the words “butter” and “wood”, giving us an idea of what the writer of this woodslip was asking for. 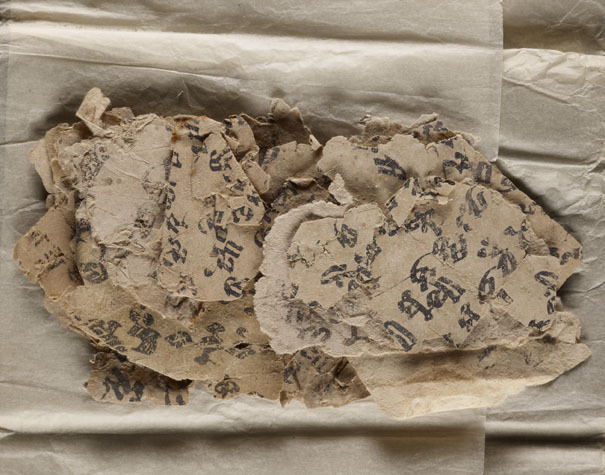 The message seems to be incomplete, so it may have continued on another slip; that hole that you can see on the right could be used to string several slips together (in fact it is thought that the earliest Tibetan imperial records may all have come in this form, before they switched to paper — see Uebach’s paper below). On the other hand, it might be incomplete because it was never finished, and never sent to its destination. That would account for its unusually good condition: woodslips were often scraped and reused, or just snapped in two after they had been read (in the watchtowers, some were turned into makeshift knives, spoons and other implements). If the message itself is mundane, I find the clear and fresh quality of the object itself quite engaging. It makes you realize that this really is something that was written when Tibet was an imperial power in Central Asia, by a soldier who probably had no idea that this power would crumble within a few decades. And because of the circuitous route that the object took to get to the British Library, this is the first time it this message has been read since that era. The bundling of the woodslips with official notes from another time and place (“Finsbury Circus, E.C.2”) also highlights this contrast. With such disjunctions of time and place, even reading requests for butter and wood can be quite exciting, don’t you think? * All photographs by Rachel Roberts. This entry was posted in Uncategorized by Sam van Schaik. Bookmark the permalink. Oh, goodness me, this is fantastic. Any chance of getting nice photographs of the Brāhmī fragment, too? Did you send them some butter and wood? Better late than never. Sorry, bad signature, ignore previous name. I’ll see what I can do about getting all those Brahmi fragments photographed. In the meantime, perhaps if we can work out where An tse was, we can fulfill the order for butter and wood. FW Thomas seems only to say that it must have been in the Khotan area, and that it is not Anxi (as in “the Anxi protectorate”) which was in Kucha. I have a note that there is something about a place named ‘An-se (also spelled ‘An-ce and ‘An-tse) in Pelliot, Notes on Marco Polo, pp. 713-4. But I don’t have that rare book handy, do you? Am I kidding or what? Are you sure it’s not Mar-yul and Sbal-kha on that woodslip and not butter? And who was Pupu Singh? Did they even have Sikhs in Khotan back in the days? Where are you seeing the wood, and would wood be good when it’s been buttered? All good questions, but would that just be me thinking so? In any case I’m now thinking that like An-tse, Mar sbal and Bri sha’ might be place names, followed by personal names, including Pupu Sing(h). In a Tibetan paper document from Khotan (TLTD II.214), we get a list of place names followed by personal names; the difference from the woodslip is that a na is inserted after the place name, but that could be omitted from the woodslip by the “telegram principle” (isn’t that what Stephan Beyer called it?). So, perhaps Mar-yul, as you say, but is there a place called Sbal-kha? I thought that was a frog? Could two proper names be Sha’-pu and Pu-sing? I’m very doubtful about Pupu Sing[h]. Well, that seems possible, though I’ve seen some very strange looking Tibetan transcriptions of non-Tibetan names — as strange as Pu pu sing. But there is a scribe called Sha ri bu whose name appears in the colophons of several Prajñāpāramitā sūtras copied in Dunhuang — I think we can guess where that name comes from! (Thomas also mentions a Khotanese who went by the name Na mo bud.) More to the point, pu does indeed seem to be part of several Khotanese names (see the list of personal names in TLTD II.261-2). Also, I see that Sbal-ti used for Baltistan at this time, and there was also a place called Sbal-pa-ri, metioned on this woodslip, if you can read it! It could also say Sbal pa ri bos [mnan du s/rta rten and then a date? ], perhaps another name? According to Thomas we have sbal pa ri’i so bzhi: “four soldiers of Sbal-pa-ri and indeed a date on line 2: ‘brug lo’i dbyar zla. Those 12-year cycles are so frustratingly uninformative! Actually, looking at the images, I prefer your reading of line 1 to Thomas’s, though I can see where he was getting so (“soldier”). I’m afraid you’ll balk at this, but Sbal-kha is Balkh. Or are we balking up the wrong tree? And I wouldn’t be too fast to pooh pooh the existence of a Mr. Pupu Singh, since anyway, you can find him on Facebook. I’m a balkh buyer for Balkh, but still pooh at Pupu. Ladakhis have their me-me and their no-no, so why not pu-pu? I am almost certain that the handwriting on the slip about Macartney is that of Sir E. Denison Ross, who was the first Director of the School of Oriental Studies. He had worked in Calcutta until 1914, when he returned to London to accept a position at the British Museum with the aim to work on the Stein material. (The outbreak of WWI crossed his plans.) We also know that the School of Oriental Studies was established in 1916 and this is when Ross became its Director, a post he kept until his retirement in 1937. 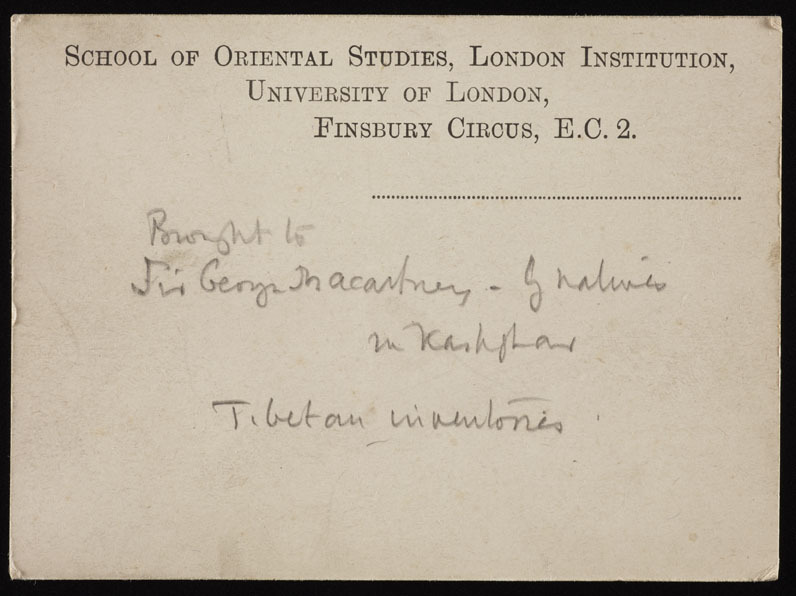 Now George Macartney was in Kashgar until 1918 so the Tibetan inventories must have been brought to him before that. The fact that Ross’ comment is written on the SOS letterhead shows that he did not write it while serving in Calcutta (which would have theoretically also been possible since, as S also mentions this, sometimes such documents were sent to Calcutta for decipherment) but already in London. This might put the date of the acquisition of the fragments between 1916 and 1918, although it is of course possible that they were acquired a few years earlier and sent to Ross for evaluation after having been lying around the British Museum for some time. But the reason they were sent to him was obviously that there was nobody else at the British Museum to read them at that time. Anyway, these are just a few thoughts that might help to track down how these documents ended up in the British Library. Great detective work! Thanks for this information, which gives us a nice short span of two years (1916-1918) for the initial acquisition of the woodslips. I think Denison Ross read Tibetan, didn’t he, which would explain how the writer of the note was able to identify the language of the woodslips and their content (more or less) as “inventories”. I guess it was some time after this that they passed into the hands of R. Corder before being bought from him by the British Museum in 1967. At that time, all of the other 2000 or so Tibetan woodslips were in the India Office Library, which explains why these two were not integrated into that collection. Yes, Denison Ross started learning Tibetan in 1910, when he was entrusted by the Asiatic Society of Bengal to prepare the new edition of Alexander Körösi Csoma’s papers. He describes in his letters how a lama by the name of Lobsang sat in his office every day, reading texts, and when he had time himself (i.e. Ross), the two of them would practice together. Although I don’t know how far he got in his studies, he seems to have been able to read texts.